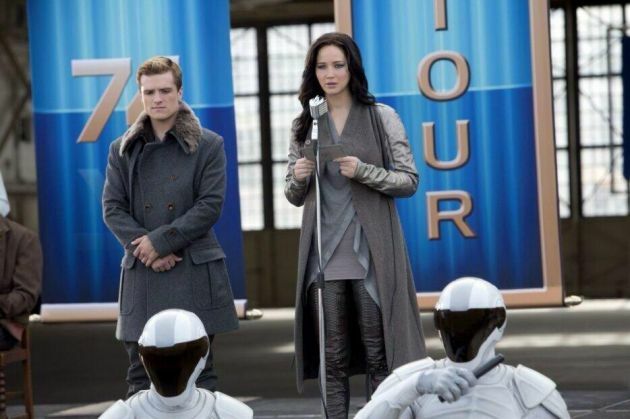 Readers of the book will know that fashion is a big part of the Capitol audience’s focus surrounding the Hunger Games, and stylists play an important role in the strategy behind a Tribute’s (or Victor’s) public image. While the description below from the book doesn’t exactly match Katniss’ on-screen wardrobe, the fact that there is a consistent theme in her outfits while on the Victory Tour is absolutely within the spirit of her stylist Cinna coordinating her clothes as he does in the books, and it does mention a “woven sweater”. I may have no interest in designing clothes but I do love the ones Cinna makes for me. Like these. Flowing black pants made of a thick, warm material. A comfortable white shirt. A sweater woven from green and blue and gray strands of kitten-soft wool. Laced leather boots that don’t pinch my toes. “Did I design my outfit?” I ask. Katniss’ outfit in the film at this point is actually quite close to this description, and I noticed when I watched it a second time that the fur trim on the collar of her coat is very similar to the trim on the collars of her prep teams’ coats when they walk into her house, which fits perfectly with Effie’s line about “eveyone’s wearing Cinna these days!” and with Katniss being an unwilling style icon. True, there are no earmuffs in the movie, (and I am not complaining about that,) but Katniss’ clothes still have a distinctive look while she’s on tour. You definitely get a sense that someone is coordinating her outfits for her, and that someone has decided that this season, Katniss is all about the knitwear. 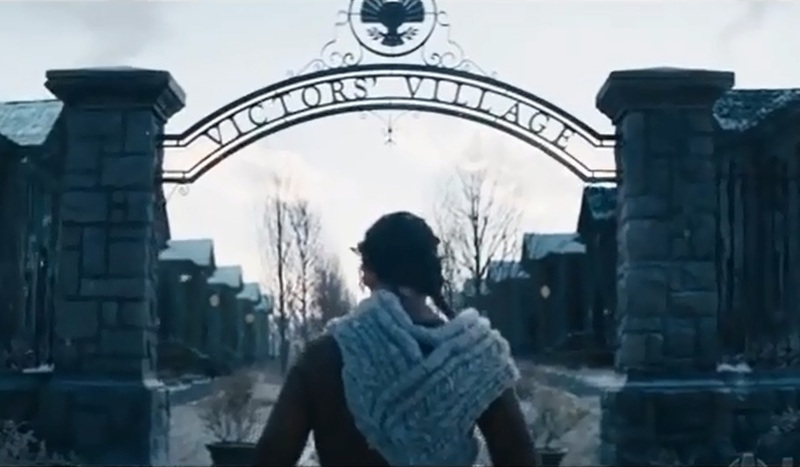 Given the popularity of her braided hairstyle (as seen in Catching Fire by President Snow’s granddaughter mimicking the look), I will be very interested to see if any characters in the next two films wear knitted sweaters that appear to be inspired by Katniss’ wardrobe in this installment. An extra-long cardigan on the Victory Tour. Beautiful knitted sweater with blocks of color at another stop on the Victory Tour. Even the nightgown she wears on the Victory Tour train is knitted. There is a scene where Katniss wanders the train at night, unable to sleep, (and unintentionally sees scenes of uprising in District 8 on the monitors in the control room), in which she is wearing another knitted cardigan, but I can’t find a screenshot of that one yet. As bowrene pointed out to me, it’s actually woven, not knitted. I like that it has a bit of structure like a Capitol dress but still fits with District 12’s rural aesthetic and Katniss’ outdoorsy nature. It’s nicer than her clothes in the first film, but she can afford nicer now that she gets a Victor’s stipend. I can picture her sharing some of her winnings with a local craftswoman by buying this cowl from her in the Hob. 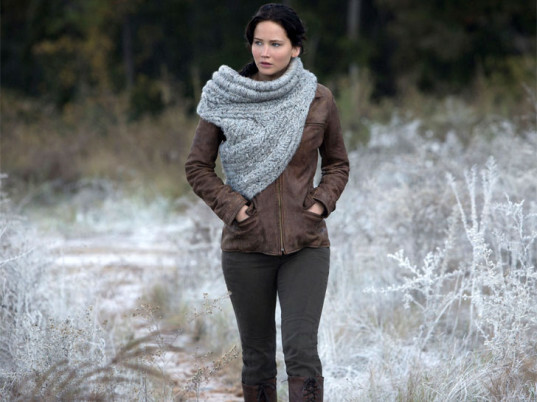 I think this blogger has come the closest to replicating the Katniss cowl as seen in the movie since she does weave the collar around rope, (see her free pattern on Ravelry here), but the bottom of hers is knitted whereas I think in the movie the bottom is some kind of weave as well. And if you look at the back of the cowl in the movie as in the screenshot below, you see that the collar is not self-contained loops. Nothing speaks to clan heritage like a fisherman knit sweater. Typically passed down through generations, these rugged pieces date back to islands off the west coast of Ireland. 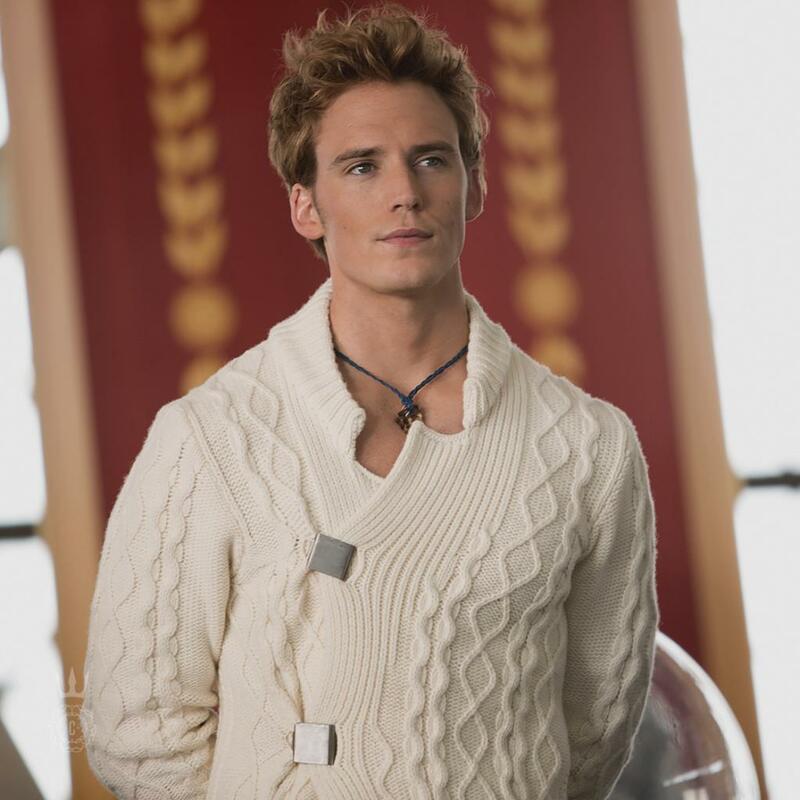 Finnick Odair’s own Aran cardigan—comprised of over 100,000 artful stitches—is a sartorial relic from his father, who fished District 4 back when sea bass and cod were bountiful. Rumor has it the debonair Victor sees his sweater as a talisman representative of his family’s Celtic strength and pride. This is a great example of the way CapitolCouture.pn mixes the fictional and real worlds of fashion; Irish clan sweaters like the one he is wearing really exist, although their family-specific patterns were originally used more for identification than fashion statements. Because the design of the sweaters became very specific to each clan, they could be used to help identify bodies of fisherman who drowned at sea and then later would wash up onto shore. I found this page that displays the distinct sweater patterns for several Clans, but it doesn’t list Odair. (You can also buy clan-specific sweaters on that page, but they’re pretty expensive). While I do think it’s a good-looking sweater and I appreciate that they put a lot of thought behind it, I’m not sure it’s very realistic that a tradition like a clan-specific Irish sweater would survive in a society that has forgotten much of its own history; according to Katniss’ narration, they don’t really even learn much in school about the history of Panem itself or what the country was like before being divided into Districts, so why would knowledge about a heritage that spanned back even further to another country have survived? Still, it’s a cool-looking sweater and an elaborate detail in the film’s world-building. 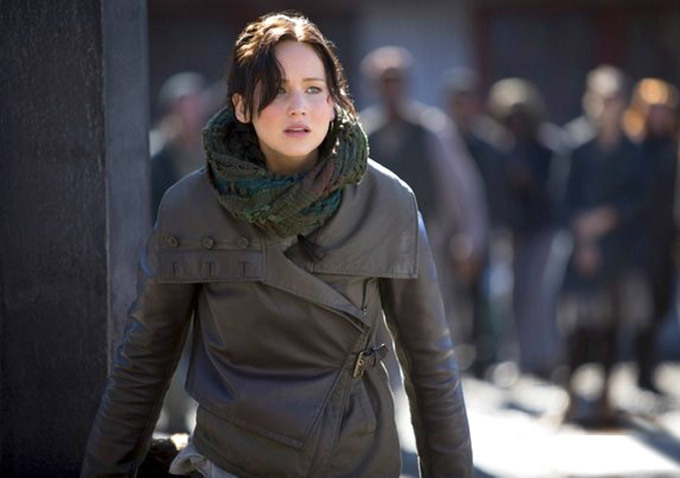 I really like Katniss’s sweater in the second picture, the black one with the blocks of brown and grey. I think even this early on in the story, it has a “Mockingjay” sort of look to it. I’d love to have a go at making it. yeah, that’s probably my second-favorite one after the cowl. I LOVE the one she wears while hunting at the beginning. 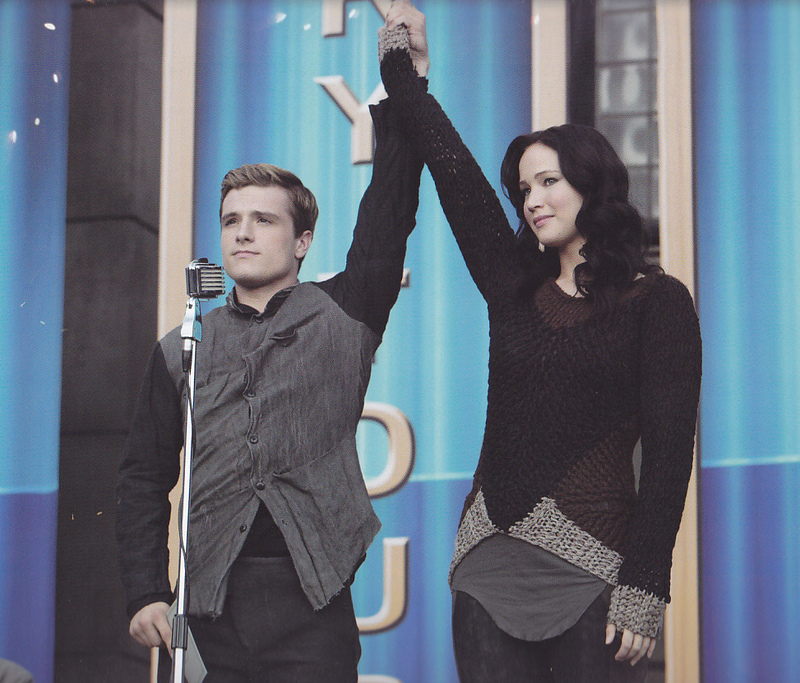 Really, they both (her & Peeta) look very sharp throughout the entire film. they do–definitely a contrast to the first film! which fits, since they’re rich Victors now. Have you found or seen any patterns for the sweater in the second picture? I haven’t, but I haven’t really been looking. If I find one I’ll add a link but if you want to look around to see if you can find one I’d suggest searching ravelry.com; (it’s free to sign up). Lady, I really miss your posts. I’ve just watched the third Hobbit movie, and remembered this blog. Anyways. Merry Christmas, and a Happy 2015! Will you be reviewing Mockingjay part 1? I’m doing a crochet version of the one shoulder cowl. Would love to make that color block sweater too. I’m glad someone else noticed these styles too!